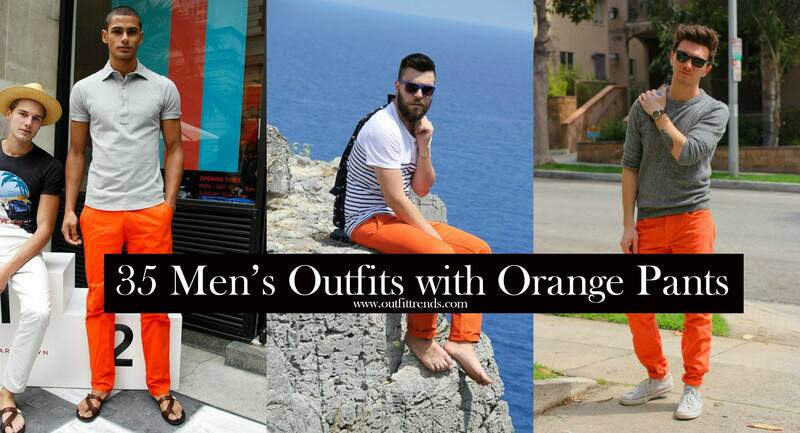 Men’s Outfits with Orange Pants. The phrase “orange is the new black” has been trending for quite some years now and it has definitely left its influence on the fashion world too. Orange pants have been in vogue and can be seen being sported by both men and women. Men can rock orange pants as well as they can stun in a pair of blue jeans. Sure, the style is challenging to pull off and can go wrong if it isn’t done justice. That is why you must always be prepared beforehand. You should be sure that the shirt and shoes etc., you go for when wearing orange pants are on fleek. If you have landed here while looking for ways you can style orange pants then you are at the right place. Here’s all you need to know in this regard. Let the orange pants stand out. Do not pair them with other bold hues. Colors like white, black, navy and gray are easier to pull off with orange pants. If you are new to the idea of orange trousers, steer clear of graphic tees. Go for plain ones instead. last but not the least, start with incorporating the vibrant color in your gym outfit. If you want to wear an eye-catchy pair of workout pants, consider getting orange ones. Not only does the bright color capture attention but it also captures hearts. Also have a look at these Men’s Workout Outfit; 20 Athletic Gym-wear Ideas for Men. Go for Orange chino pants with a striped navy and white round neck tee for a stellar appearance. For the classiest look, opt to wear vibrant orange dress pants with a crisp white button down shirt. Throw on a black blazer and black tie for adding to the suave. You can wear your orange khaki pants with a light gray dress shirt and dark gray tie. Pull on a navy blazer for max style. Brown shoes and belt would go hand in hand with the rest of the outfit. Here are the best Khaki Pants Outfits for you. Orange leather pants for a tough yet bright look. Wear a white tee with it so that the overall look is toned down and leans toward the rough side. Step into black boots for enhancing the overall look’s sass. Instead of the same old blue or black jeans, try something different. Wear orange jeans for a cool look. A plain gray shirt would look very neat with it. Do check out these White Jean Outfits for Men that are ideal for Summers. Go for orange track pants on days you want to feel extra snugly. The hat really makes this look perfect so do check out this guide on How to Wear Beanie for Men. For the hipster look, experiment with confidence. Going out for brunch? Slip into orange pants for the ultimate snazzy yet nifty look. Keep it minimal while traveling. Orange pants with a white shirt would do perfectly. Toss a hat on your head for a chill vibe. Here are 15 Best Summer Travelling Outfit Ideas for Men. Running out of time to get ready but you aim to look unique? Don’t sacrifice that wish. Sport an orange pant with a sky blue button up shirt for a laid back look. You’re bound to notice people throwing appreciative glances your way. RECOMMENDED: 18 Latest Men Casual Outfit with Blazer. Want to go for street wear? Put on a striped black and white tee with your orange trousers. Throw on a navy printed button-down shirt and keep it unbuttoned for a stylish look. Navy will never fail as the ideal color combo with orange. A navy dress shirt with a pair of orange jeans would make for a flawless attire. Here are 21 Most Popular Swag Hairstyles for Men to Try this Season to pair with your swag outfits for a complete look. Dining out with friends and family? Make certain you look sober and stylish. Go for orange pants with a white button-up shirt and put a navy or black sweater on if the weather demands it. There are several ways to style orange pants. All types of shirts can go with the right kind of orange pants. Try wearing your orange trousers with a plaid button down shirt. Check out these Men’s Outfit with Jogger Pants for some more awesome looks. You can wear the mainstream shoe colors like black, white and brown shoes with orange pants. You can also go for colors like navy and purple. Choose to wear sport boots, sneakers, loafers, depending on your attire. The color orange has some restrictions when it comes to color combinations. You can rock orange pants with navy, purple, black, gray, brown and sky blue. Colors like shocking pink, peach, yellow and red don’t make the ideal partners. Here are some coolest Men White Shirt Outfits for this season. Burnt orange is the go-to color for those who want to stay away from the neon version which is much more striking. Don’t miss out these 15 Smart Spring Work Wear Outfits Combinations For Men. Light orange for the summer days. Pair with other light shades. Dark orange for the cold days. Wear you best knitwear and heavy boots with the trousers. You can take some inspiration from Daniel Radcliffe and go for double orange. For the post look, wear a tailored attire. Navy blazer, orange pants, light blue dress shirt, deep brown shoes and belt and you are ready to go! Look breezy in the sunny and hot weather with a half-sleeved button down shirt and orange pants. Spring is all about being refreshed and that is exactly how your look must be as well. Try this look: stripped blue and white shirt with orange pants. Brown dress shoes with no socks. Here are 20 Ways to Wear Blue Suits with Brown Shoes Ideas for Men. For a comfy look, throw on a gray polo shirt and slip into orange pants.